We are fortunate indeed that some Mari Lwyds, flying in the face of tradition, have crossed the Severn and Tamar to visit us in Cornwall each Dark Gathering. It’s wonderful to see traditions not only surviving, but thriving by evolving with the times. Certainly the inhabitants of Boscastle who were visited by the Mari Lwyds in 2017 were delighted with the experience, and look forward to return visitations of these special figures of folklore. Hobby Horses or ‘Obby ‘Osses’ as they are known in Cornwall, have been around since the early 19th Century and have been associated with begging traditions over the Twelve Days of Christmas, the most famous and oldest example being the Mari Lwyd from South Wales. There is also evidence of these Hobbys appearing at Halloween or Samhain in their role as ‘death horses’. There are exceptions to this as demonstrated by the Padstow and Minehead Osses which appear at May Day. According to popular contemporary Pagan thought, the Hobbys are a symbolic representation of Epona the Celtic Horse Goddess. The May Day Osses represent fertility and the Midwinter Solstice Oss, death and rebirth. All these beasts are accompanied by Guisers or Teazers who help guide the Hobbys through the streets and into buildings. Certainly in West Cornwall the guiser/teasers were often cross-dressed and blacked up, and so in a magical sense bridged the worlds between the Oss and the onlookers. Examples of Hobbys are found throughout Europe and Scandinavia, however in Cornwall I have found to date only three examples of documented history for Obby Osses – Lands End, Penzance and Padstow. Of these, two are reconstructions of the originals – Penkevyll is the Lands End Oss and Penglaz the Penzance one. Whereas the Padstow Oss has not only continued but has evolved into two Osses – the Old Oss (Red) and the Temperance or Peace Oss (Blue), which appear at different intervals during the May Day celebration. Relatively recently other Osses have started to appear, particularly at the Midwinter festival of Montol in Penzance where all sorts of strange beasties have begun to emerge. There is also a growing trend in Mari Lwyds in Wales if the Chepstow Wassail is anything to go by – at the time of writing (2018) there were 22 of them at the annual Muster which gathers in the grounds of Chepstow Castle. Please note that due to logistical limitations, all Osses or Mari Lwyds appear by invitation only. 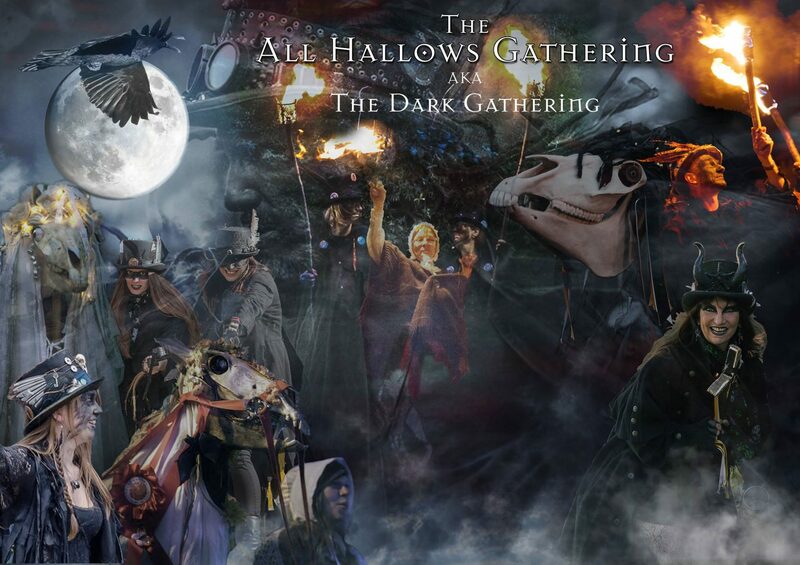 Please contact the Event Organiser for further details if you wish to appear at the Dark Gathering.